Tabletop gaming and other musings. 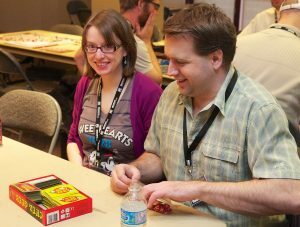 Playing Chez Geek at Gottacon. Gaming conventions are a great place to meet new people who share your interest, try new games without taking the risk of buying a game first, and to share your favourite games with others. But if you’re an introvert like me, sometimes conventions can be intimidating because they require a fair amount of energy and socializing. Fret not! The good times and gaming at cons definitely outweigh the energy requirements. Over the years I’ve learned ways to make the most out of gaming convention while keeping my introvert sanity. Start small / go big. There are advantages and disadvantages to attending small conventions and bigger ones. Small conventions tend to be quieter, but more intimate. Bigger conventions make it easier to disappear with the crowd, but the noise level and number of people are also a lot more stressful. I plan my activities and break times for each type accordingly. If it’s your first time going to a con, determine what size you’re comfortable with against what you hope to get out of the event. Take a friend. This ensures you’ll always have a buddy to play games with. It’s even better if you have an extroverted friend who knows your introversion. I’m terrible at introducing myself and making small talk, but husband is awesome at it. Or if I’m feeling particularly bashful about approaching someone I want to talk to, he either helps to give me courage or is willing to step up and help me approach them. Find a quiet space. Whether it’s a quiet corridor or a coffee shop down the street, find a space where you can get out of the noise. This will help you build your energy reserve back up again. This is especially important if you aren’t staying at the con hotel and don’t have your own space to flee to! Stay at the convention hotel. By having a space that’s my ‘own’ that’s only a short elevator ride away means I have that quiet space I can escape to when I just need to get out of the noise and be a zombie for an hour. I know this can be costly, but over the years I’ve found this is the best option for me attending a convention. Otherwise, try to stay with a friend who lives close enough to the convention and doesn’t mind you returning to their place by yourself for a few hours. Take breaks. Don’t feel pressured to DOALLTHETHINGS. Instead of gaming 12 hours straight, set your own pace. Watch games being played, go for a walk, or borrow a game from the library and read it’s rulebook. Stay fed and hydrated. This will help you keep your energy levels up for longer. Volunteer. Sometimes having a specific task to focus on makes it easier for me to break out of my shell, especially when I’m having a low energy day. Go outside your comfort zone. I’ve made awesome friends, learned new games, and had some cool opportunities happen because I was willing to go outside my comfort zone. That’s not to say you have to be uncomfortable for the entire event, but sometimes introducing yourself to a game designer, trying a new game, or volunteering will be worth it. (Of course, when I say go outside your comfort zone, I don’t mean try something that is or makes you feel unsafe. Trust your gut). Introvert friends: are there any other tips for introverts at conventions I missed? Hi! I’m Andrea, a dice loving, tea drinking, tabletop gamer in Vancouver, Canada. Here on Wisdom Check I share my thoughts on the board game and RPG community, including conventions, introversion, anxiety, and being a women in the tabletop community. Wisdom Check © 2019. All Rights Reserved.